The Los Angeles Rams were 2-0-1 and featured the NFL’s best rushing offense as they faced the Miami Dolphins on October 3, 1976. Head Coach Chuck Knox preferred a conservative offense paired with a solid defense, and the running of HB Lawrence McCutcheon and FB John Cappelletti had accounted for 682 yards on the ground in the first three contests. There was uncertainty at quarterback, however, as James Harris (pictured at right) had been sidelined for the first two weeks of the season due to a broken thumb on his throwing hand – Ron Jaworski and Pat Haden had each taken a turn behind center in his place. The Dolphins, under Head Coach Don Shula for the seventh year, were 2-1 and in the midst of retooling after having won three straight AFC titles and back-to-back NFL Championships. They still had the outstanding Bob Griese at quarterback, but the running game was not as proficient as it had once been and Griese had dislocated the middle finger of his throwing hand during practice the previous week. Furthermore, injuries amid the linebackers were making the defense vulnerable and the Dolphins were forced to shift to a formation with a five-man front and two linebackers. Harris, wearing a brace on the injured thumb of his throwing hand, largely shifted away from the running game to take advantage of the weakness in the middle of Miami’s passing defense. The Rams were further helped by the added wrinkle of using three wide receivers in key situations and, in particular, having WR Ron Jessie line up in the backfield where he was used as a man-in-motion. Still, the home crowd at the Orange Bowl saw the Dolphins take an early lead in the first quarter when HB Benny Malone ran for a touchdown from two yards out. They extended the lead in the second quarter thanks to a 28-yard carry for a TD by FB Norm Bulaich. Meanwhile Harris threw for 197 yards in the first half, but LA couldn’t get on the board as DE Vern Den Herder blocked a 49-yard field goal attempt by Tom Dempsey and FS Barry Hill blocked another try from 22 yards. Dempsey failed a third time when he was wide on a 29-yard attempt. Down 14-0 at the half, the Rams struck quickly in the third quarter as Harris threw to Ron Jessie for a 58-yard touchdown. Miami responded with a scoring drive that led to a one-yard TD carry by FB Stan Winfrey. Harris again went to Jessie, who made an over-the-shoulder catch of a perfectly-thrown bomb in the end zone for a 43-yard touchdown that cut Miami’s lead to 21-14. As the third quarter was winding down, the Rams put together a drive that took them inside the Miami 20. On a third-and-seven play at the 15, McCutcheon took a handoff but then flipped a lateral back to Harris, which he picked up on the first bounce and advanced all the way to the three for first-and-goal. On the second play of the fourth quarter, Harris leaped into the end zone from a yard out to complete the 46-yard series and, with the successful extra point, the score was tied at 21-21. LA put together a 75-yard drive in seven plays to take the lead, with Harris throwing to Jessie for 26 yards and WR Harold Jackson for 25 along the way. McCutcheon ran a sweep for a nine-yard touchdown to cap the series and, with the successful extra point, the Rams were in front by 28-21. The Dolphins weren’t finished, however, and two minutes after Los Angeles took the lead, using just three plays, they came back with a 47-yard touchdown pass from Griese to WR Nat Moore to tie the game. Now it was LA’s turn and Harris came through with another big play, throwing to Jackson for a 50-yard gain to get to the Miami 11. Three running plays advanced the ball to the two and Dempsey, making up for earlier failures, kicked a 19-yard field goal with just 1:56 remaining to provide the winning points. Interceptions of Griese desperation passes by SS Dave Elmendorf and FS Bill Simpson snuffed out any further hopes for the Dolphins and the Rams came away with a 31-28 win. The Rams outgained Miami (593 yards to 319) and had the edge in first downs (23 to 21). The visitors accumulated the bulk of their yardage (426) through the air while the Dolphins gained most of theirs on the ground (219). LA also had more penalties (8, at a cost of 76 yards, to three flags on the home team) but, with the late interceptions, the Dolphins led in turnovers (two to one). James Harris had a huge performance, completing 17 of 29 passes for 436 yards with two touchdowns and one interception – he also ran the ball six times for 29 yards and a TD. Ron Jessie caught 7 of those throws for 220 yards and the two long scores. Harold Jackson contributed another 99 yards on just 4 catches. Lawrence McCutcheon uncharacteristically had more receiving than rushing yards as he gained 99 yards on 5 pass receptions and led the team with 91 yards on 22 carries with a TD. For the Dolphins, Bob Griese went to the air just 11 times and completed 6 of them for 100 yards and a touchdown with two intercepted. Benny Malone led the running game with 19 attempts for 111 yards and a TD and also caught two passes for five more yards. Nat Moore gained 66 yards on his two receptions that included a TD. 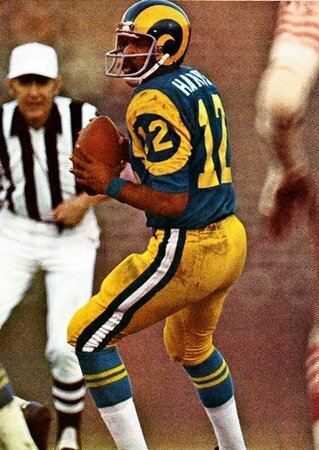 The single-game yardage total was easily the most of Harris’ career (his second highest output was 294) and the most by any NFL quarterback in 1976 – in fact, it wouldn’t be exceeded until 1980. It did not assure the 29-year-old veteran security as the starting quarterback, however, and by the end of the season Pat Haden was behind center. While typical of LA’s unstable quarterback situation during the Knox years, it did not sit well with the African-American Harris, who suggested that race might be a factor in the decision-making – especially when he ended up as the NFC’s leading passer for the year (89.6 rating) while going to the air just 158 times in seven games. He was traded to San Diego in the offseason (an equally frustrated Ron Jaworski refused to sign a new contract and was dealt to the Eagles). Despite the quarterback carousel, the Rams won the NFC West for the fourth straight year with a 10-3-1 record, leading the conference in ground-gaining. And for the third consecutive season they advanced to the NFC Championship game and lost, this time to Minnesota. The injury problems that plagued Miami continued throughout the year and the Dolphins finished third in the AFC East with a 6-8 record. It was the first losing tally they had posted during the Don Shula coaching reign. 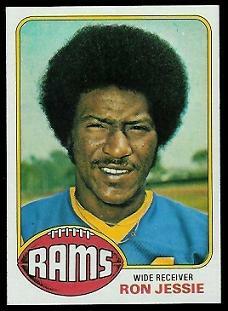 Ron Jessie continued to be a formidable deep-threat for the Rams, averaging 22.9 yards per catch on 34 receptions for 779 yards with six touchdowns. He was selected to the Pro Bowl for the only time in his career.